It's tough running a blog, believe me. You need to come up with ideas that excite both you and the readers. And you need to attract readers that will comment intelligently. You can vouch for me that the latter part doesn't come easy. In my case, where we've been doing this for almost 5 years - it'll be 5 years in May, look it up - it's especially difficult since it ultimately comes at the expense of family time, work time and most of all, learning Torah time. That's right, I learn Torah too, and not just Likutei Sichos. AAMOF, I wish I could learn more LS. So in a week before Purim, during tax season, you'll have to excuse me if I lose cheyshek. And after weeks and months and years of bickering with many of you here you'll have to excuse me if I lose the will to keep on updating the blog. But call it addiction, or call it the fact that I feel like I give people something to look forward to a few times a week, but I go on, and even now I feel like I can't just give it up. Not just yet, anyway. It may not be very far off in the future, but the time has not come yet. Not because I haven't "fulfilled the objective of the blog," just because it doesn't feel right yet. On that note - the note of accepting derochim that may be different than standard Bukovina and Marmuresh - let's review what we have posted above. We have the zeide of the holy Reb Pinchos'l Koritzer going to meshumodim - I assume they were shonoh U'peirush'nikkes, not third generation unaffiliated Jews - and begged them to say Shema, and promising them his share in Olam HaBoh just so they should say it. He was a pretty pushy "Kiruv professional" it seems, telling them "why do you care to say it, you've done כל עבירות שבעולם already, say Shema, even if you don't mean it. That eventually helped many of them to return to the path of Torah. 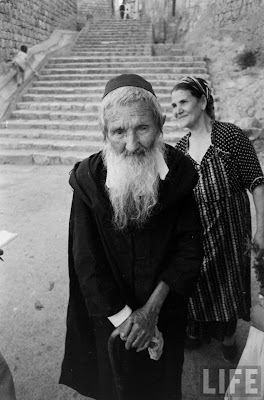 Now obviously not all tzaddikim had that shittah, but please don't knock it when you see it, especially when we're dealing with mostly unaffiliated Jews that don't even have religious great grandparents anymore. Be tolerant if you want tolerance in return, and that goes for all of us. 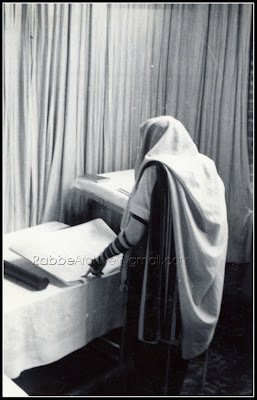 Enjoy some photos of the Rebbe, zy"a, on various Purims, courtesy of The Avner Institute. A moment on Purim, 5724. 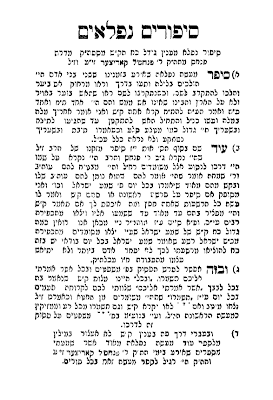 Purim 5725 in YRCB. A very fun listen. It looks like RYH was not used to hittin' the bottle very much - which is a good thing, of course - and he got a little rough around the edges. Minus his usual air, if you know what I mean. The boys sound like they're having a grand old time. I'm a stickler for accordion music, so I really like the Shoshanas Yaakov they have going on there. Who says Litvaks can't have a grand old time? And who says they can't totally destroy the Alter Rebbe's nigun while having that blast? Credit: a blog I'd rather not name, due to the juvenile level of grammar etc. UPDATE: Thanks to Mottel we now have a new link! It seems like Lakewood - or rather the defenders of the Lakewood system - has a disproportionate amount of sufferers of ADD and lack of reading comprehension skills. They sit and read what I say, but they can't understand it. They draw conclusions that are not there, and they simply misread what I wrote. How sad that these are the leaders of today and tomorrow. I've heard this here often, people telling me to look at Lakewood and see 6000 people hurreven in teyreh and see what a major success story it is. They see this as the dream of its founder coming to fruition, that somehow this is what he imagined - a town of thousands, brand new housing developments, and a Honda Odyssey in every driveway. They nebach think that it's some kind of shutdown tayneh they have against me; that after that I have nothing more to say. The truth is we all know that Lakewood is the churban America. America could have had thousands of marbitzei torah, and thousands of fine baaleibatim - OK, thousands more is what I mean. Now what we have in Yerushalayim D'Ocean County, NJ is a town of thousands of bitter, downtrodden and hopeless people. People without a purpose or mission in life. People who question their existence every single day and grind through it like hamsters running the wheel. Now, before you try and rip my lungs out listen to this: These are not my words, but the words of a pretty prominent Rosh Yeshivah himself, as well as a known mashgiach and darshan. The graph we use here, which was published by the yeshivah administration themselves, is supposed to make us very excited, but in reality all it does is show us how they've deviated from the plan, despite what they'll tell you. 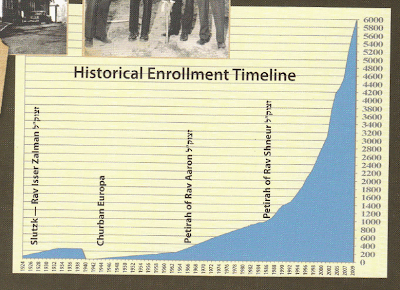 The graph tells us that in 1962 there were 200 talmidim in Lakewood, which includes kolel yungeleit. The number was probably closer to 150. I know, there were less Jews and less Bnei Torah at that point in time. True, but it was also not a coincidence that 150 was the number. I once heard of a meeting between Rav Kopelman of Lucerne and the holy Rebbe Reb Aron of Satmar. The SR asked RK how many bachurim he had in his yeshivah at that time, to which RK responded that he had 200, adding that 200 was the maximum amount that he could control and keep tabs on. The SR, not to be outdone said that his limit is 1000 bachurim... They say that RK had nothing more to say to the SR, he realized who he was dealing with. But that's not the real point of the story, the point is that the monstrosities of Lakewood are not what the founders had in mind, simply because they don't work. They don't work because they provide no jobs - despite the fact that yeshivos are not created for the purpose of giving shtellers to the Rosh Yeshivah and his extended family - or are they? If my eyesight isn't failing me I see that according to the chart provided graciously by BMG there were about 800 talmidim at the time of Reb (Yosef Chaim) Schneur's passing. That probably includes kolel yungeleit as well. It seems like RSK was trying to keep to the Kopelman rule, at least somewhat. I hardly believe that it was his dream that the yeshivah turn into the monstrosity it is now. Forget about the town itself and what IT has become, that's another story for another time. So what we have now is hundreds upon hundreds upon hundreds of yungeleit and not so yungeleit who do nothing but wonder what has become of them. They have no purpose, they see no goal in their learning and they have nobody to share what they learn with. AGAIN, I'm not speaking about shidduchim crises or discussing the issue of men not working or women working, or the fact these poor daughters ans sons of kolel yungeleit cannot afford to get married All we're talking about is the fact that the size of the yeshivah has stunted the growth of torah in America because it does not allow for torah to grow elsewhere. Yungeleit beg to be able to say a shiur or a chaburah anywhere, in ANY shul or mesivta, just to feel somewhat accomplished, otherwise they wonder what have I done with my life just sitting here?! Who's responsible for this travesty?! I had the good fortune of spending several hours with Reb Chatzkel Besser z"l about a year and a half ago. Maybe two years by now. I had read the book "The Rabbi of 84th Street" a few years before, and had reviewed it here and was very interested to meet him in person. Obviously we all "knew" Reb Chatzkel just from reading Jewish literature and newspapers, but the book spoke of a totally different persona, a much more exciting one. We can easily say that Reb Chatzkel was the last of a breed that they just do not make anymore. A fusion of erlichkeit despite his dealings in business, and one who could be accepted in all circles despite belonging and being active in a very defined circle. A ben torah who never forgot his roots and who never gave up hope. Reb Chatzkel was an Agudah askan, but was at home - not just tolerated - with all others as well. There are other such askonim out there, maybe even older than RCB, but none have such widespread acceptance as he did. None of them could step out of their confined Agudah space and join forces with others. And in today's day and age that's a rarity. More on our meeting; I won't lie, I was nervous about meeting him. Here he was, this statesman who met regularly with kings, presidents and ambassadors, and he was gonna meet this Hungarian Lubavitcher nobody. What would he be thinking? how much time would he give me? what would we speak about? All these questions raced through my mind as I was preparing to knock on the door, but the concerns were unfounded, as it turned out. Reb Chatzkel made me feel like a million bucks that day. Despite the fact that I intruded on his breakfast - to which I might say הלוואי אויף מיר געזאגט אזא פרישטאג יעדן טאג - he was a true gentleman, being extremely patient to my questions and gracious despite my intrusion. He owed me nothing and had plenty of other people visiting, so it's not like he needed me. I learned some things that day, and I shared some of my thoughts and observations in subsequent posts that I uploaded after that, despite the fact that I may not have mentioned the visit back then. After breakfast we retired together to the study/living room ("retired," I've always wanted to use that term but never had the chance!) and we spent some time speaking of the issues of the day, Radomsk, of course, and Lubavitch, again, of course. He was kind enough to tell me what happened on several occasions when he had yechidus with our Rebbe, zy"a, but was firm enough to also share some of the less pleasant moments... Again, all this to a nobody, and no, he wasn't a Loshen HoRah peddler, he knew what to share and what not to. The truth is the point here is not so much to tell you what happened with me as it is to share with you a little about the loss we just experienced. Very few people today - if any - can draw the Rebbes of Ger, Amshinov, Bobov 48 and Bobov 45, Dinov, Makov, Bluzhev, the sons of the skverer rebbe who called that he doesn't feel well, Reb Shmuel Kamenecki, Reb Malkiel Kotler, Hakham Yosef Harari-Raful, R' Yudel Krinsky and R' Binyomin Klein of Lubavitch, as well as Rabbi Adam Mintz from the Lincoln Square Synagogue? I realize we hear cliches about people when they pass, but there really ARE people - or at least were. The book on Reb Chatzkel - I mean the frum version, not the one written by a non-Jew - if written by the usual vanilla writers will probably miss the point. They'll make him some kind of puppet to Rabbi Sherer and that will be it. If we're lucky they'll throw in some Radomsk and maybe something about Polish Jewry after WW2. But they'll pass up writing about what made him tick, as well as what made him so special, one of a kind. I'm resigned to this fact, it's the world we live in as Jews, as frum Jews, as Lubavitchers. Unless of course his eynikel Reb Yisroel will have something to say about it, then maybe there's hope. Sruly seems to have yarshened some of his zeide's pikches and knows how to think out of the box. Oy, now I'm rambling. I promised myself I would write a nice, coherent, maybe even moving piece, and that I wouldn't make it all about his connection to Lubavitch, which lots of you don't appreciate, despite the facts, and now I'm not sure if I accomplished some of the objectives on the list. 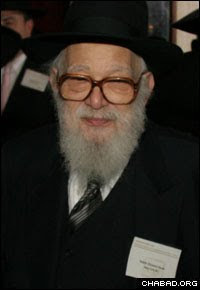 Reb Chatzkel, the world will miss you now more than ever. May your family be comforted amongst the mourners of Tzion and Yerushalayim, and may we see you very soon, with all those who rise for techiyas hameysim, speedily in our days. Another Vechter situation on hand? Are you familiar with the garbage that's going on currently in Williamsburg, concerning a yeshiva opened by a Yoeli Roth (grandson of R' Yecheskel Roth)? this Yoeli Roth is a follower of the mohorosh (Lazer Shick - HT) (a self-styled derech in breslover chasidus). The yeshiva caters primarily to "shvache" bochrim, but it seems that also quite a few "gitte" have a geshmak in the derech which is being preached there. so of course the tattes of these supposedly "gitte" - who suddenly woke up, and realized that they have an obligation to be mechanech their offspring - are all up in arms, and es passt zei nisht the whole thing, and they are making a mega stink, with fur flying all over the place and from both sides. after having read your blogs for quite some time, it is obvious to me that you are git bahav'ent with the tahaluchos of chinuch in the wb sector, which leaves somewhat to be desired - as probably also most everywhere else - so it would be interresant to see some give and take on the matter. 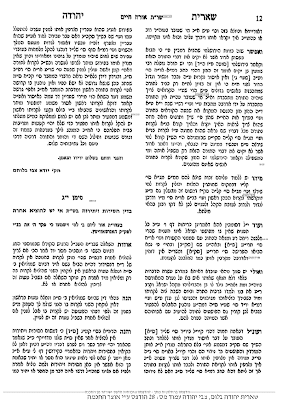 I personally am familiar with some of the shvache in there, who were mammesh saved to yiddishkeit through him. One of them is a major brand name, an einikl of one of the - takke - greatest litvishe rosh yeshivas in our time. Ok, they sing and dance these "bummy" nigeenem, but they also learn (or say) 18 perokim mishnayos, plus yom tehillim, chumash rashi, likutei moharan, plus whatever else, in addition to regular gefe"ss (גפ"ת) learning. It's a setting geared as such so that whichever level the bochur is, he feels a sippuk rochni. but mit dem allem, it is not the norm, not what the rebbezcheeseyoogenolayni (that's רבי זכותו יגו עלינו) wanted, so menn darff ess oiker min hashoiresh zain. 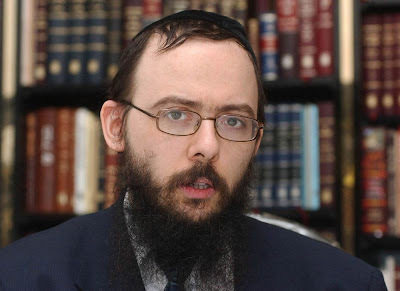 It seems like this Yoel Roth was once a mashgiach in Viener Mesivta in Williamsburg, which is now either teetering on the brink or totally defunct. His partner in "crime" was also once employed by Vien, and they were unceremoniously sent packing when their Breslover tendencies were revealed. Now he started his own place and is having a strong impact on young bachurim, just like Vechter did. The difference is that Williamsburg iz andersh today than it was 30 years ago. Oh! and Vechter wasn't new age like these guys are. He was pretty much mainstream besides for teaching them Chassidus. And his Yeshivah was for prety good bachurim. Here, Roth is catering to a different type of bachur and has a different goal in mind, at least that's what I heard when I asked around. So whereas 30 years they would terrorize the guys, beat them within an inch of their lives, cut off their beards, and so on, today they can only "protest." Times sure have changed. Or maybe they haven't? Let's wait and see. I love how he threatens the people that wanna close him down! 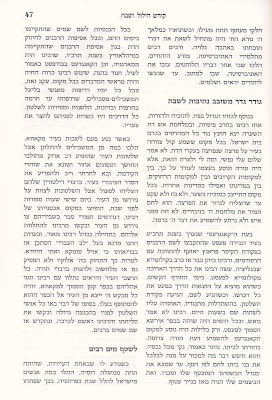 Click on the link to see Rabbi Burech Oberlander's review on the new Mechon Yerushalayim book Kehilos Hungaria, courtesy of Seforim Blog. It was on my wish list, but now I'll need to paste in all the corrections as well. The book seems to be ripe with very juvenile mistakes. As far as RBO goes; It seems like you can take the Hungarian out of Hungary, in this case you didn't even do that, he's back in Hungary ----- (after a stay in New York) but you can't take the Hungarian out of the Hungarian, if you get what I mean. I know it sounds all wrong, but it's as right as right can be. trust me. Reb Burech is the Chabad head shliach in Budapest and a known expert in all matters Hungarian. Jewish/Hungarian, that is. He compiled an Hungarian-language siddur [nusach ashkenaz!] and is a common contributor to many of today's most popular charedi publications. It's tough to eulogize and even thank a man whom you met only once - rather saw only once. Yet, despite never have met him I owe so much to him. As do so many other yungeleit that found parnosehs and are feeding their families - barely, due to his vision, for lack of a better term. Yet despite his accomplishments I doubt there was a man who had to deal with so much, you'll excuse me, crap, over his life. 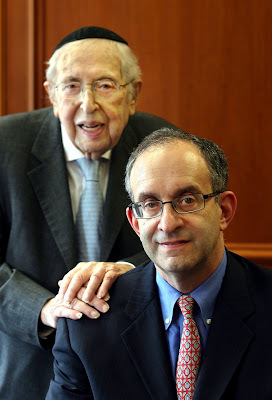 I'm speaking of course about Dr. Bernard Lander, who left this world two days ago. We would be hard-pressed to find a man who provided such a service to the community, yet had to deal with such attacks from often some of they very same people. What I mean is this: I think we can all agree that not all of us are cut out for full-time learning, myself included. Come to think of it, this notion that a person should sit and learn and either live off schnorr, the Government, his wife working, or all of the above, is a new and unheard of one. So I'm not quite sure why we need to make excuses for going to work to feed your family... So what should we all do if we cannot sit and learn? find a parnosoh, obviously. So how does one find a parnosoh if he cannot just go to a wealthy family parent, sibling or family member? he goes to work. How does one find work if he has no skills other than being able to shlep boxes? Not that it's a bad thing to shlep boxes, but not all of us find ways to raise a family on that kind of salary. Some can. I definitely cannot. Well, Dr. Lander found a way. By eliminating all the excuses he left no choice for many of us, we had to go and learn a trade or profession, and here was the means to do it. Not only were there no women in school during your class, there were no women in school THE WHOLE DAY. They had separate days for men and women, not just hours! You didn't have to study any subject that might even be accused of being counter to Torah values and views, and you could do it all on Sundays, evenings and summers. But still, the zealots, since they need to keep busy, would go after him and accuse of him of all kinds of things. I guess it has a lot to do with his background, him being a musmach of YU, and not being subjugated to Daas Teyreh, but still, even that should have its limits. When you see the obvious advantages should you not just bite your tongue and keep quiet? Maybe that's what has happened. Maybe they gave up the fight when they saw they had no better alternative. In any case, as far as I'm concerned I'm glad that I heeded the advice of those who dispensed it and enrolled there. Dr. Lander gave me the chance to learn a profession in a very comfortable setting, without compromise. The only thing I could've done was maybe choose a better profession, but that was my choice, otherwise I'm happy as far as that choice goes. The only time I met the good Dr. Lander was at graduation, and even then we didn't actually meet. He was there, as was I. that's about it. Maybe that should've been the time to thank him. I guess he did it because he liked helping other Jews, not for the thanks he wouldn't get... He really had very little to do with the day to day operations of the school when I was there, as far as I know. Never mind, there are still ways for Touro to improve and be less selective when it comes to our brothers and sisters in need, but hey, nobody's perfect. We can look for excuses as to why NOT to thank him, and we can focus on the faults of his fine institutions, but that would be nothing short of the height of ungratefulness. Let me take this opportunity to thank him and all those who assisted him in making it possible. And remember, it never hurts to thank someone who helped you, even if you do disagree with him on certain issues. Reb Chatzkel has left us. What's Rabbi Twerski Running From? If you watched the clip from living Torah, where at 1:45 and on Rabbi Dr. Abraham J. Twerski is seen "going for a dollar" with some of his family members, you may have wondered: What is Rabbi Twerski running from? He seems very uncomfortable, as if he'd rather not be here. He presents his eyniklach and basically looks for the door. I see it as his first meeting with the Rebbe, which is surprising, with him being an eynikel of the Mitteler and Alter Rebbes, and with him being "in Golus in Chabad" in Pittsburgh for so many years. The Rebbe makes light of the situation, by making Rabbi Twerski a Tura, a mountain, who's entrenched in his place of work and does not move. Twerski, on the other hand, never bothers to answer why he's never been there before; Chassidisher Shtoltz, I guess. I imagine there's a story behind it and I'd like to know what it is. I viewed the clip. I do not notice him rushing for the door. 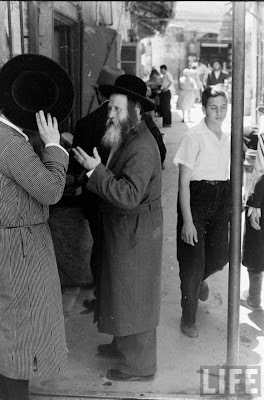 While I have never been to receive a dollar from the Rebbe ZT”L, I heard descriptions many times of the long lines. He did much as I also do. When there are people waiting, he takes as little time as possible to enable the next person to go. He could have easily spent longer, and could have also had “yechidus” had he chosen to do so. But under the circumstances, he took as little of the Rebbe’s time as possible. No discomfort, no rushing to leave. As to not having been there before, that is inaccurate. He had been to yechidus with the Rebbe numerous times. He also lived in Pittsburgh, and his travels did not always take him to Crown Heights with time to spare. There were many communications, mostly indirect, for many years. All the while, he was not a Lubavitcher chossid, but very far from being a stranger or an unknown to the Rebbe ZT”L. Sorry, no juicy story here. P.S. 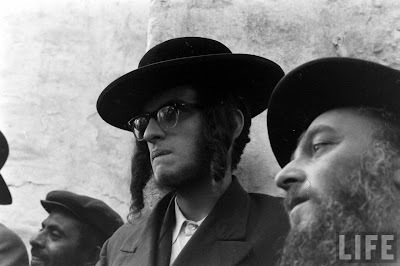 – I am an eyewitness to his having yechidus with the Rebbe in 1963 (approximately). The last letters published in this series were from late 1954. Although I remained in Chevron another few months, the few letters that I have to hand from that period mainly concern my plans for the future. I had wanted to settle in EY and go into the seforim publishing business but........ What follows is a current reconstruction of the essence of a mislaid letter from February or March 1955, and with this I conclude. [Although I had received Semicha whilst still in Gateshead Yeshiva from Rav [Shmuel Yosef] Rabinow, my parents were keen on my harvesting an "Eretz Yisroel" Semicha or two. My original plan had been to try for one from R' Isser Zalman Meltzer. However, as I mentioned in an earlier letter, I only managed to see him once before his Petirah. 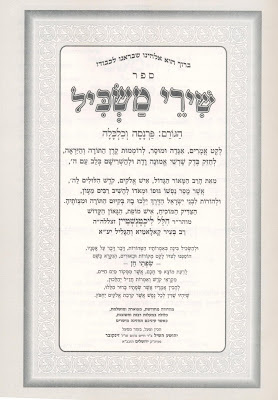 At that time most Chevroner bachurim considering rabbonus (and there were few who weren't ) went to Dayan Eliyohu Romm, a distinguished Talmid Chochom, who showed considerable regard and benevolence to any Yeshivah Bochur of promise. After some late-night revision, getting the treasured certificate from him was not too great a struggle. With this in my pocket I thought I may as well get a third. The Chief Rabbi, Yitzchok Herzog, may not have pleased some Charedim with his political views, but all acknowledged his Geonos. I was told that he had ceased giving Semicha, but thought it worth a try. 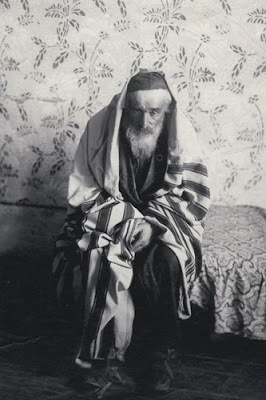 I had some protektzia as he had known my grandfather, R' Eliezer Adler, the long time leader of the Gateshead Kehillo, and had been friendly with my parents, who urged me to persevere. 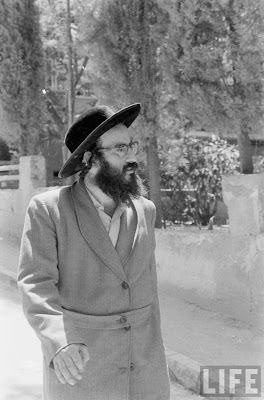 At that time, before Purim 5715, he was officially "out of town" recuperating from a bout of ill health, but I discovered that he was actually resting incognito at Pension Reich (no relation) in Beth Hakerem. 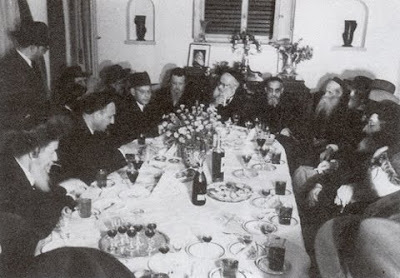 A meeting at the home of Rav Herzog. 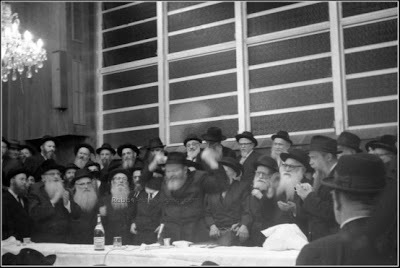 We see the Tchebiner Rov, Rav Isser Zalman, and Rav Chaim Leib Auerbach, among others. דאס וואס מיר זעהן דא קאן יא זיין א שטיקל חידוש; אידן ווערן צופייערט און פארפלאמט ביי שאלישידעס פונקט ווי אין די הייליגע באראפארק און וויליאמסבורג! אויף דעם האב איך זיך שוין נישט גערישט. איר פארשטייט? מיינע זיידעס און באבעס, כאטש זיי האבן אפשר מער געליטן ווי די זקנים דא, און טראץ דעם וואס זיי שטאמען אויך פון ארץ הגר, זענען נישט געפארן קיין פלארידע יעדעס יאר ווי עס איז היינט שוין די מאדע. איך געדענק אפשר איין מאל וואס איין באבע איז געפארען, און דאכט זיך אהן די זיידע. זעהט אויס אז לא זכינו - אדער לא זכו, בעסער געזאגט. זיי האבען נישט פארשטאנען וואס די היינטיקע זקנים פארשטייען....היינט צו טאג איז שוין כמעט א מצוה אפצוזיצן דארט חדשים לאנג, בפרט נאך ווען מען קען זיין בצילם של גדולי עולם, וואס דער עולם אין ניו יארק קאן דאס נישט! ס'איז אכשיר דרא! א וואקאנס מיט אלע מעלות... די ניו יארקער עולם גייט וואכען אהן טישן און אהן תפלות פאר'ן עמוד, און אהן דעם אז מ'זאל קענען אריינגיין צום רבי'ן מיט א קוויטל. אבער די זקנים - זיי קאנען יא. זיי זעהען דעם רבי'ן ווי ער איז אויפגעלייגט, און ווי ער איז מיט ווייניקער דאגות און מוה. כ'פארגין זיי מיט'ן גאנצען הארץ. זאל זיי וואויל באקומען. זיי האבן עס ערליך און כשר פארדינט. 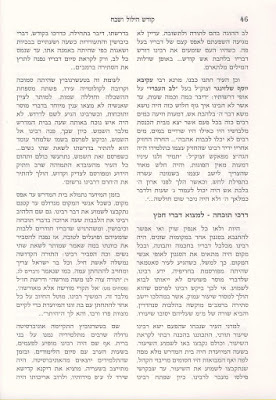 A Tshuveh from Rav Yuda Blum, Hanshovitzer Rav, and son of the Beis Sheraim, zt"l, where he discusses giving aliyos to those who are pasul L'edus, such as a kohen who marries a grusheh, or other people who transgress the Torah. I would assume that in those days they were not Tinokos SheNishbu, but rather people who "knew better." Still RYB finds ways to be mattir. 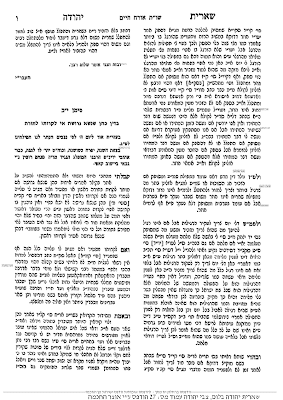 There's a z'man gromo'dike mekor, with the mention of the "medrash aseres hadibros." What was brought to my attention as the main point is the fact that he makes use of the fact that MECHALILEI SHABBOS etc. WERE given aliyos and maybe even counted for minyonim! And again, we're not talking Tinokos SheNishbu here, people. And WE ARE talking post Teilung Hungary here. Photographs are reproduced from the An-sky photo-archive, courtesy of Petersburg Judaica, European University at St. Petersburg. I'm a sentimentalist. A little too much, maybe. I see these pictures and others like it and I cry. literally. I know that sounds cheesy to some of you, but I can't help it. Which is maybe why I revel in discussing old time history, even if some of the squabbles no longer exist. What also "gets" me is how many of these towns are virtually unknown in Jewish history, despite the fact that they may have had thousands of Jews living there for hundreds of years. And then you may have little hamlets that had 12.5 Jews that are recorded forever in the annals of. How many of you have heard of Letichev before today? Do we know who this "preacher" was? He may have been the Rov there. Who knows? He looks like a yid who suffered all his life. The Litvaks will tell you that it's all about the "Teycheh," that wherever there were yeshivos etc. there was continuity and therefore legacy. The chassidim will tell you that wherever there were Rebbes that shared the love of Hashem with the people, dort iz yiddishkeit, and that's what we remember. Well, it may be partially true part of the time, but it definitely is not etched in stone. There are thousands of mekomos torah and chassidus that are totally forgotten, or exist only in book form. There are plenty of gedolei Olam who are forgotten about. That may be because they never published chiddushim or tshuves, but still. We might just say that it's all mazel. That way nobody feels bad about his ancestors or their Rabbeyim being forgotten about. So I was reading the Artscroll "Rav Dessler" book over the last few days. Some good reading there and some typical whitewashing as well. As is to be expected. Things they don't want to discuss they just figure that you either will figure out elsewhere, don't need to know, or are not smart enough to realize that they just pulled fast one on you. I'm talking about his connection to the Alter Rebbe and Toras Chabad. The description of the "Talmud Torah" in Kelm with all of its rules and regulations and expectations is fascinating, despite it somewhat resembling a Swiss finishing school with all its rules. Seems like they got a little overzealous with the whole mussar and tikun hamidos/shleimus haOdom thing. 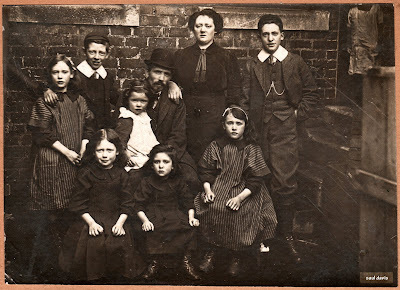 So anyway, I searched for some Gateshead pictures and this is part of what I found. 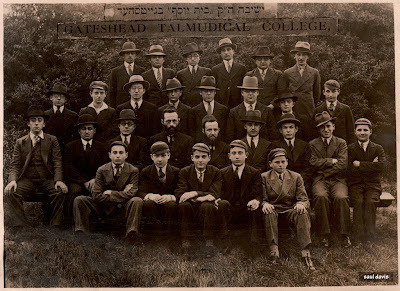 Rav Dessler - of course - founded the Gateshead Kolel - check that, he was the founding Rosh Kolel - during WW2 and headed it until he left for Bnei Beraq. This after some years in London as Rav in several shuls, where he had gone to seek his fortune, a fortune he needed to pay back creditors of both himself and his father Reb Reuven Dov. 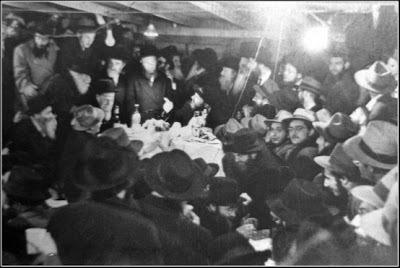 The first night of YomTov I ate at.... [why the dots? - HT] Their eldest is just beginning to talk a mixture of Ivrit, Yiddish and English. The Yeshivah has a separate Succoh for sleeping, but that did not enable me to get an average of more that six hours per night during the whole of Yom Tov as festivities continued to the early hours of the morning each day. Chol Hamoed is very prominent here with few shops open and Shtraamlech etc. worn. Simchois Bays Hashoevoh were held all over the City, the highlight being two evenings in the Yeshivas Hamasmidim and the one in Chevron with jazz bands and microphones which somehow blend quite well with the Jerusalemites. I enjoyed the Yeshivas Hamasmidim more. The unsophisticated Simchoh cannot be described. There are many types of dances Horas, Debkas, bottle dances and impromptu efforts. Long after midnight I dragged myself home convinced that "Mi Shelo Ro'oh Simcho Zu Lo Ro'oh Simcho MeYomov". On Simchas Torah all or nearly all Yerushlaim comes to Chevron. The art of singing and dancing has been developed to a fine degree and it is one of the sights of the year. One of the specialities is "Se'u She'Orim Roshaychem" when the Sifray Torah are taken out. [They are replaced in the Aron Kodesh between Hakofos.] There is a block of about a hundred jumping up and clapping over their heads in front of the Uren Kodesh, whilst behind them are semi-circle after semi-circle charging backwards and forwards to the magnificent tune. The Hakofos ended at 2 am but singing continued until 3.30. You must be wondering when we ate - well, Kiddush was made before Maariv and dinner was served all through the night. and the Olam went down in groups.